Here is a simple delicious side dish perfect for the coming Fall season and holidays or just because. I love sweet potatoes, baked, fried, mashed, in a casserole but these oh my goodness. These may be my new favorite. the scooped out potato goes into a bowl, add a dash of nutmeg, 3 TBSP butter, 1/8 cup of milk or heavy cream, salt and 3 TBSP of brown sugar. Mix with an electric mixer. Scoop into the hulled out potatoes. In a sauce pan, 1/2 cup brown sugar, dash of nutmeg, 3 TBSP butter, 2 oz Evan Williams white label bourbon or whatever brand you prefer and 1/2 tsp of molasses. Cook on low until it begins to thicken. Too long and it becomes candy. Since July 30th I have been very sick. I normally have a document that I keep things in that are funny or interesting. This month that just hasn't happened as I've spent more time in the hospital than at home. So instead of making something up, trying to think of something funny or interesting. 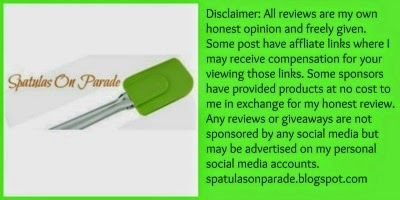 I'm going to forego this month and direct you to the other participants. I promise you will not be disappointed. There is always something funny going on with these ladies. I spend a lot of time alone these days. Since I no longer work outside the home, the boys have been grown and gone for years and I have no family members that I'm taking care of. Not complaining about that last one at all. BUT with that in mind, I have a lot of free time. I mean, come on, it doesn't take long each day to clean, cook, prepare ingredients or straighten up 1000 sq ft of living space. So...I get bored, did you see my post on boredom? LOL well, I do. I get bored and when I get bored my mind wanders. PLEASE if you see the poor little thing send it home, it is entirely too small to be out in this big ol' bad world. Anywho...when my mind wanders it takes to Google and starts searching random stuff. Not bad stuff or naughty, just random. Weird laws in my county...oh boy there are some doozies! What dessert was popular the year I was born. NOW we're on to something! By the way it was Chocolate Tunnel of Fudge Cake, need I say more? If you know me you know that I am a self confessing chocoholic through and through. So that brought me to my next search, what was popular the year...each of my boys were born. Interesting but not as thrilling. Next, what was a popular dinner served in...my birth year. Okay, 1966. I know, I know. Dang I'm old but glad to be here kicking. Curious as to what it was? Chicken a la King, with shrimp cocktail being a new fancy appetizer on the scene but small parties were serving up a new quick dip. French Onion Dip with chips. Yeah boy 1966 was a good year! There was also the ever popular jello salad or mold where they used a bundt pan filled with fruit and jello. GROSS not my thing but I do remember my mother, aunts and grandmother making these on a regular basis. For me it's a texture thing. Fondue parties were a big deal in the 60's and they were revived several years back with the restaurant The Melting Pot. I even succumbed to the idea and purchased a fondue pot, which I used three times in ten years and sold at a yard sale. Meatballs with grape jelly in the sauce, yep you heard that right. My first encounter with this was in the 90's a church. It seemed every potluck we had, someone was showing up with a crockpot full of meatballs. They were good and I enjoyed them until I asked for the recipe. WHAT? Ketchup and grape jelly?! Oh well...and I must like meatballs more than I realized, after surfing through my blog I have 7 yes 7 recipes for meatballs. That doesn't include the balls or bite size snacks and desserts. As you can see my search ended, I was stuck on food, reminiscing about the past and dreaming of my next meal or what I could cook to satisfy my dreams of the past. In 1989 the year we met vegetarian food was making itself known all over the country. My dads family, well siblings, were the only vegetarians I knew until the 1990's. I guess prior to that they were all in hiding. It's a joke, don't freak out. The year my husband was born, Pink Champagne Cake was all the rage. He wasn't thrilled over this but it definitely peeked my interest. My boys desserts were: chocolate cake and funfetti cake for the youngest two. Funny my oldest doesn't eat dessert, my middle will eat anything but my youngest is very fond of funfetti. Out of all this, I decided to go for the pink champagne cake. It was different, pink and cake. Of course we all know that I WILL be baking a chocolate tunnel of fudge cake, how could I not?? Then again, I've never fixed chicken a la king either, so I may give that a go with my own twist of course. It's a very simple recipe with several ways to prepare it and serve. I have made similar dishes but...now I'm up for a challenge. Recreating this classic. Mix well but do not over mix, pour into a greased pan and bake. Baking time and temperature per box instructions. Beat butter until creamy smooth, slowly add vanilla and powdered sugar, alternate with champagne. Add in food coloring last or leave out. I wanted everything pink so I added it. Top with sugar pink sprinkles, optional. Keep this cake in the fridge. It will be firm and dense after the first 24 hours but delicious and you can set it out for room temperature if you do not like it cold. 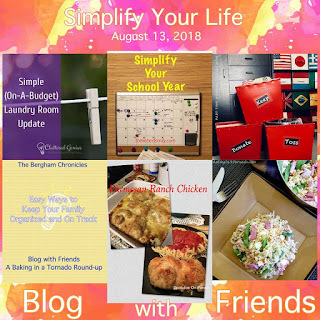 Welcome to the August issue of Blog With Friends where each month we chose a different theme and each participating blogger works that theme into a post in a way that best suits them and their readers. This month our theme is "Simplify Your Life" well that is perfect because simplifying is exactly what I've been doing. Cutting down, cutting out, de-clutter, simplify...and not just with donating and/or selling items we no longer need or use. I am cutting down and simplifying my life in other ways. Like cooking. Now don't get me wrong. I love to cook you guys know that. But with this heat...I'm finding myself reluctant. So what is the solution? Salads? Smoothies? Fruit? Eating out? Yes and no. Salads are a great solution but it's not just a bowl of lettuce. It can be chicken salad, tuna salad, turkey salad, egg salad, pasta salad or kale salad. I said kale and I know some of you turned up your nose. I did too at first to be honest. But I do love kale. Even in a smoothie, yes that's right and no I'm not crazy. I find that on mornings when it is cooler I can cook in bulk, saute meat, grill and even roast different foods then later all I have to do is heat them up or chop the meat and add to a salad. I boil eggs, cook chicken, make chicken salad or tuna salad that can be eaten as a sandwich, on a salad or by itself. This simplifies things for me, creates less heat in the house and I find allows me time to do things in the afternoon without having to stop and cook.